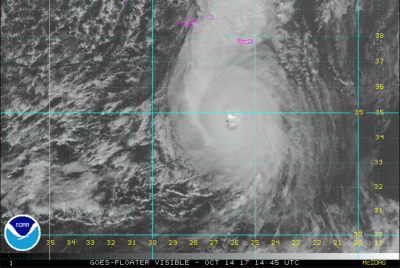 On the morning of October 14th, 2017, at 11:00am AST, Hurricane Ophelia was upgraded to a rare major hurricane south of the Azores Islands in the far northeastern Atlantic. 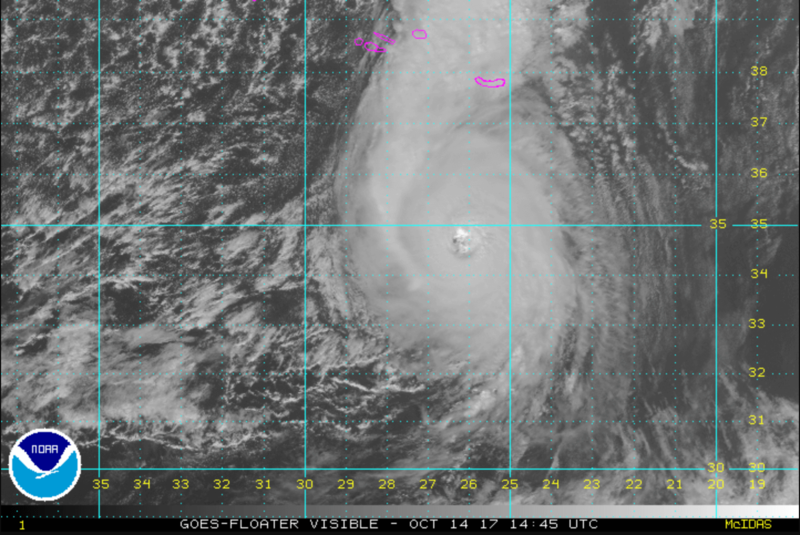 Ophelia is a Category-3 hurricane on the Saffir-Simpson scale, with maximum sustained winds of 115mph. 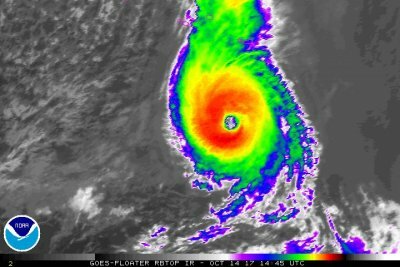 Three days earlier, on October 11th, Ophelia became the 10th consecutive hurricane in the Atlantic Basin for the 2017 Atlantic Hurricane Season. According to meteorologists at the NOAA National Hurricane Center in Miami, Florida, there are no major hurricanes on record since 1851 that have occurred where Hurricane Ophelia is located now (at latitude 34.8N and longitude 26.6W to be precise). The last hurricane that achieved major status in this region of the Atlantic Ocean was Hurricane Michael in 2012, and was located roughly 1500 kilometers west of Ophelia’s present location. Since Ophelia achieved major hurricane status, it now makes it the 6th major hurricane of the 2017 Atlantic Hurricane Season during the past 50 days. This ties with previous hurricane seasons in 1933, 1961, 1964, and 2004, for the most major hurricanes to date through October 14th, according to tropical research meteorologists at the Colorado State University. 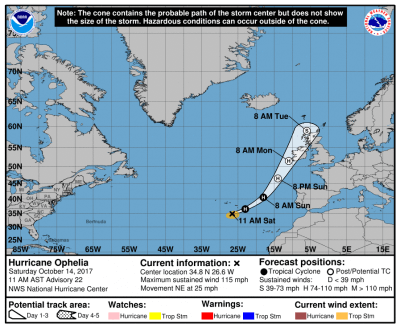 Ophelia is forecast to transition into an extra-tropical cyclone as it recurves to the northeast towards Ireland. 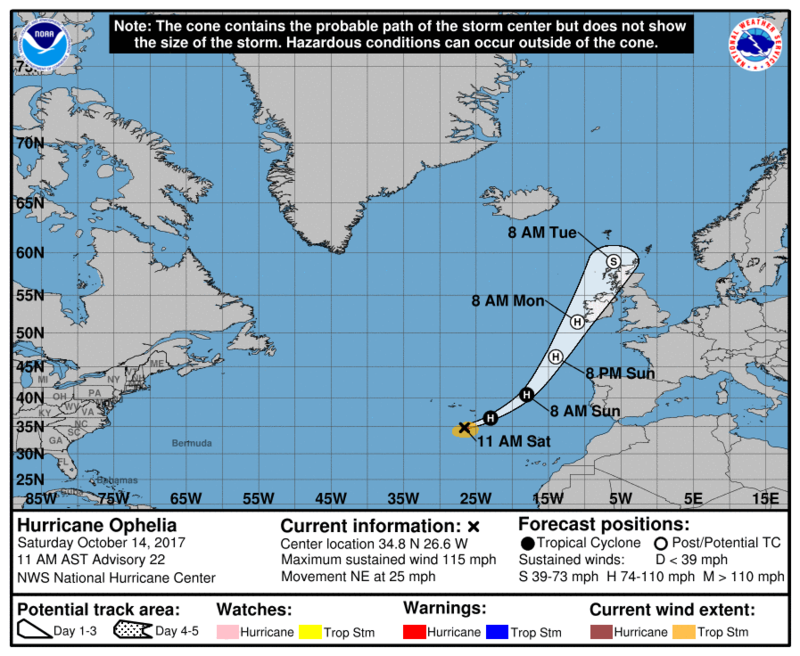 Although it is expected to lose its tropical characteristics, hurricane force winds are likely as it nears Ireland by Monday morning. The Atlantic Hurricane Season is from June 1st through November 30th. There are currently no tropical systems posing a threat to the United States at this time. However, tropical weather can always be monitored at the National Hurricane Center‘s website. Tagged Hurricane Season 2017, hurricanes.